Flight pioneers prior to the Wright brothers would crash after barely getting up in the air. One of the major problems was a lack of balance in their aircraft. Balance is affected by the airplane's weight and lift distribution. For an aircraft to be correctly balanced for flight, its center of gravity must be near or at its center of lift. Weight is the force of gravity on the airplane. The center of gravity is the point where all weight is concentrated. If an airplane is hung by a piece of string from its center of gravity, it will balance in the correct flying position. The center of lift is the point where all lift is concentrated. All of the lift force concentrated on this point has the same effect as the distributed lift forces. You can change the center of gravity of a paper airplane by adding weight anywhere along the body. If the plane flies nose down, add weight towards the tail or remove weight from the nose. Do the opposite if the plane flies nose up. You can move the center of lift by changing the launch angle, bending the wings up or down, and by bending flaps up or down. Move the center of lift back by bending the flaps down or lowering the angle of launch. This corrects for nose up stalls. Bend flaps up and launch with an increased angle to correct for nose dives. Make a Floating Wing Glider for testing. Move the center of lift forward by curling the wing tips up higher. How does the plane fly? What happened? Moving the center of lift forward causes the plane to fly nose up and stall. Try correcting this by adding weight to the plane's nose with a paper clip or a small bit of clay. Experiment until the plane flies level. Why was balance restored when you moved the center of gravity forward? Explanation: For a plane to be in balance, the center of gravity and center of lift must be near or at the same point. Moving the center of lift forward had destroyed balance, so you needed to move the center of gravity forward to restore it. Move the center of lift backward by curling the wing tips down. How does the plane fly? What happened? Moving the center of lift backward causes the plane to fly nose down and crash. Try to correct this by adding weight to the plane's tail. A couple of paper clips, one on each side of the tail, will usually bring the nose back up. What did adding weight do? Explanation: Adding weight to the tail moved the center of gravity backward. Since you had moved the center of lift backward, this restored the plane's balance. Four forces: Paper airplanes fly much like real airplanes and are affected by the same forces. These forces are thrust, lift, drag and gravity. Thrust is the forward motion of the plane. Lift is the movement of air around the plane that keeps it in the air. Drag is the resistance to movement through air. Gravity is the force that pulls everything back to earth. For anything to fly the forces of lift and thrust must balance the forces of drag and gravity. Paper airplanes are really gliders, since they do not have power. The early developers of aircraft, like the Wright brothers, used gliders to learn about the basics of flight. 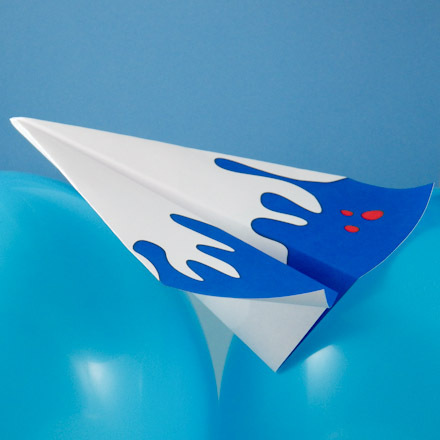 You can learn these basics of flight, or aerodynamics, by making paper airplanes.